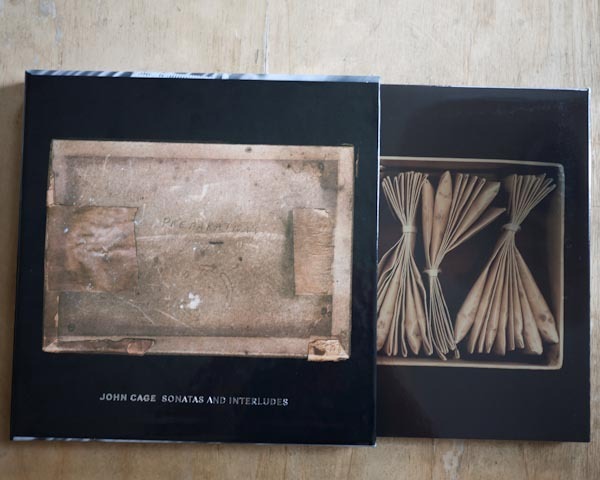 Did you know that John Cage made kits of preparations for the Sonatas and Interludes and sold them through a new music journal published by Henry Cowell? These kits contained 45 envelopes, one for each note of the preparations, that held the hardware he used for his preparations. Did you know that Cage created a document for performers in 1949, after the publication of the Sonatas and Interludes, that further detailed his preparation process and intentions? With this information, I believe performers can arrive at a better-prepared piano. The focus of this guide is on the practice of preparing the piano for John Cage’s Sonatas and Interludes, without addressing musically interpretive ideas. Just like any well-trained classical musician, the performer is seeking a level of authenticity. But for this music, the search for clarity among all of its ambiguities will certainly deem authenticity a futile endeavor. So what’s a performer to do? In order to answer this question, I have created this guide for pianists interested in performing this magnificent music by compiling various sources of material that will help the pianist arrive at a better-prepared piano and hopefully something closer to Cage’s intentions. The sources, some of which are from John Cage himself, help answer some of the questions a performer will inevitably have when confronted with the challenge of preparing various pianos for these pieces. Finally, I hope that my own experiences of preparing several different makes and models of pianos will help round out this information so that the pianist can be better equipped to handle these challenges. I’d like to start with what we all know, having purchased the score of music published by Edition Peters, which is the table of preparations pictured above. The very first problem a performer will encounter, which can be a point of obsession, is deciding on what material to use for the plastic, rubber, bolts, etc. I have to say that I find the ambiguous nature of this part of the table exciting and it certainly adds to the allure of interpreting this music. Ultimately, the performer needs to discover this material on their own through experimentation, but to still be helpful in this regard, I’ll discuss some of the materials that I use and what I have seen other pianists use. 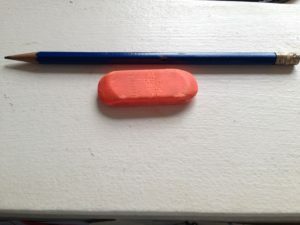 The eraser that Cage specifies in the table is for an American Pencil Company eraser that is not made anymore. 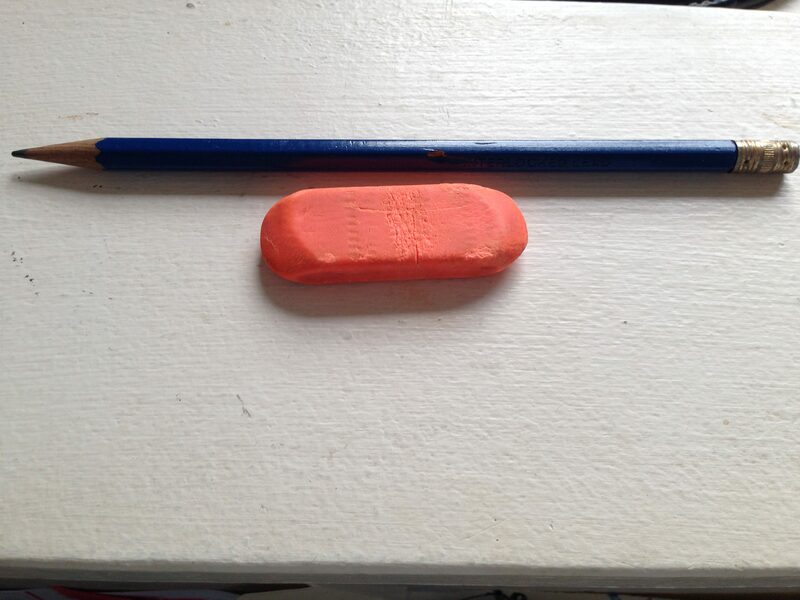 Rest assured though that the erasers that are commonly available will do the job just fine. The one I use is pictured above and is 1/4″ thick. If you look closely, you’ll see that this one is starting to split from being wrapped around the string, so I keep a spare one around for performances in case this one bites the dust. Cage asks for a lot of pieces of rubber for these pieces. These can be easily folded over the middle string and will effect all three strings. When I went to the hardware store to pick up items for the preparations, they had sheets of rubber of varying thicknesses that I could purchase by weight. I picked up a 6″x6″ piece of 1/8″ thick rubber and one of 1/16″ thickness. The 1/16″ rubber was perfect and easy to work with while the 1/8″ was too stiff to easily get in and out of the strings. The thicker rubber also eliminated much of the desirable resonance of these notes. I cut this 1/16″ rubber into pieces about 1″ x 1/4″ for each of the preparations. The second-lowest preparation uses rubber which is wrapped around the threading of a screw. It is interesting to me that Cage specified this. He was careful to not place anything metal in direct contact with the copper. Excepting this, all metal preparations are used on the steel strings. Stephen Drury, in his short video, recommends using canning jar seals that are cut into size. The most useful tips that I found from Stephen was to use brass whenever possible (which is a softer metal than the steel strings) and to use plastic bread-bag ties for the plastic preparations. I try to follow this the best I can to be faithful to Cage’s specifications in the table. However, depending on the piano, I may need to substitute a lighter or heavier material. For instance, notes that require multiple preparations, like the high ‘f’ with three preparations, will put a lot of tension on the strings and therefore a smaller diameter material is needed thus making the weight of the preparation lighter. Also, when a preparation is required close to the bridge, a larger diameter material is needed as the distance between the strings tend to be farther apart than in the middle of the strings. 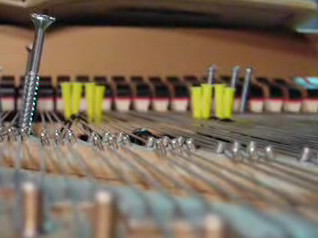 Three of the notes have nuts placed on the bolts which rattle around for a bit upon playing the note. Depending on the piano and the nuts, other pitches may sympathetically vibrate these nuts (insert bad joke here) when played. This can be really distracting because ideally the nuts should only rattle when that specific note is struck. In order to resolve this problem, I always have extra nuts of various sizes to swap out with one that isn’t working well. Aesthetically, the sound of a nut large enough that it isn’t even threaded onto the bolt can be really nice. The duration of the rattle is significantly shortened, but it certainly can take care of the problem of sympathetic vibrations. Just be careful that it isn’t so large that it touches neighboring pitches. Also, I should note that too tight of a threading will result in higher probability of sympathetic vibrations or may not even rattle at all. In short, experiment with different threading, loose and tight, and don’t forget to test these by playing all the other notes on the piano. I’ve used thin plastic cut-up cards of various sizes and plastic bread ties for these preparations. I’ve seen photos of people using plastic drywall anchors. The photo from the wikipedia article on the Sonatas and Interludes shows this being used. I haven’t tried it, but this is a misinterpretation of Cage’s table. Cage asks for the plastic to be threaded through the strings, over 1 and under 2 and 3. But it is difficult to understand what he means here, because if you try to do that to just one note, the plastic will fall through. He intends to have that same piece of plastic be used across the neighboring note—one piece of material for two pitches. Again, the bread tie is an ideal size for this. The plastic will need to sit at a slight angle for the correct measurement. Here is a photo of my prepared Steinway O. From the New York Public Library’s website, they describe this 1949 document: “Cage created this document to instruct performers of ‘Sonatas and Interludes.’ Such a precise description was necessary for the performer because the technique of preparing a piano was still a novelty.” Yes, well it may have been a novelty then, but that certainly doesn’t mean that it is so commonplace now that everyone knows what they are doing and are able to produce good results. Discovering this document was extremely helpful to me because it gave further elaborations to his instructions and intentions. I laughed the first time I read this initial instruction to “…put yourself in a frame of mind conducive to the overcoming of obstacles with patience.” That is certain. In fact, this is a big part of the appeal of this work. The process of overcoming these obstacles is always different and changing, very much like the Sonatas and Interludes themselves. For me, the process of preparing pianos is zen-like. I imagine it is akin to a Buddhist sand mandala—taking meticulous care in creating something truly beautiful and precise. One moment it’s here and the next it’s gone—a fleeting moment of a process. The second item addressed in Cage’s document is the envelopes of preparations. The images above are from archival material provided to me by Laura Kuhn of the John Cage Trust. The Trust holds two piano preparations kits created and used by John Cage for his Sonatas and Interludes. One of which was in the possession of Richard Lippold when he died and was given to the John Cage Trust many years ago by his partner, Augusto Morselli. Images of both were used as the “front and back” of the 3 LP set produced in 2012 of this work, as performed by Nurit Tilles; design was by Naomi Yang. 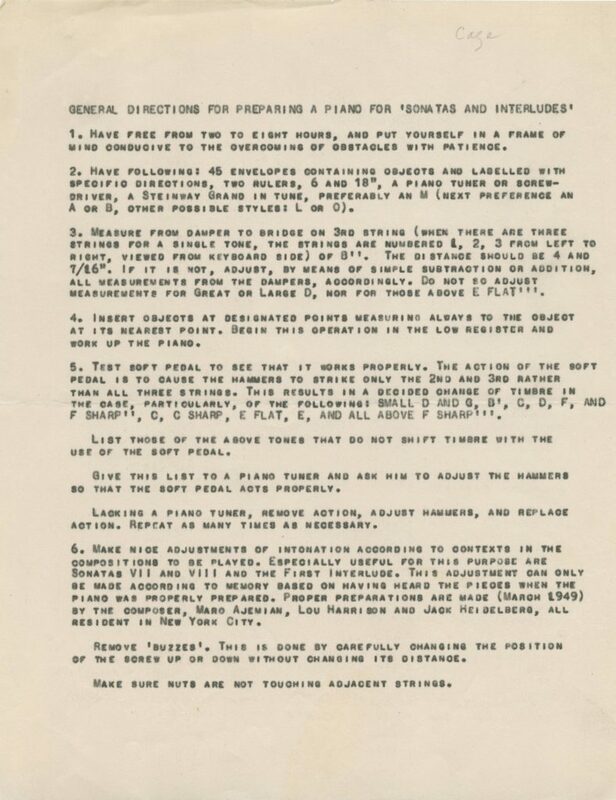 As you can see from the first image, these envelopes of preparations contained information that is more specific than the table and information in this 1949 document. Once upon a time one could buy the Sonatas and Interludes with all the preparations – from the New Music periodical edited and published by Henry Cowell. Which, in 1950, I did. Some year later Cage couldn’t find his preparation kit and asked if I had one. I did and gave it to him, and never got it back. 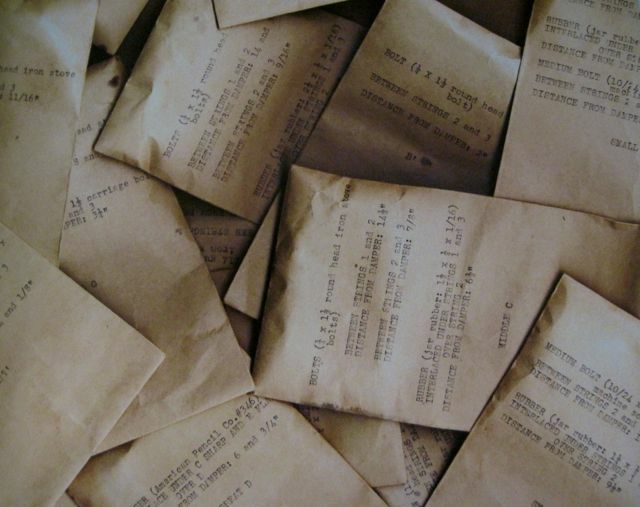 Obviously, a great deal of time has passed since Cage’s 1949 document and these envelopes are no longer obtained by pianists looking to perform this work. But there is still some useful information on these envelopes which help show Cage’s intentions. In the center of the image of envelopes above, an envelope for ‘middle c’ reads, “Bolts 1/4 x 1 1/2 round head iron stove bolts.” Others read “Carriage bolt,” “Machine screw,” etc. The only documentation that I have come across which fully details the information on these envelopes is from Simon Peter Anderson’s 2012 thesis mentioned above. 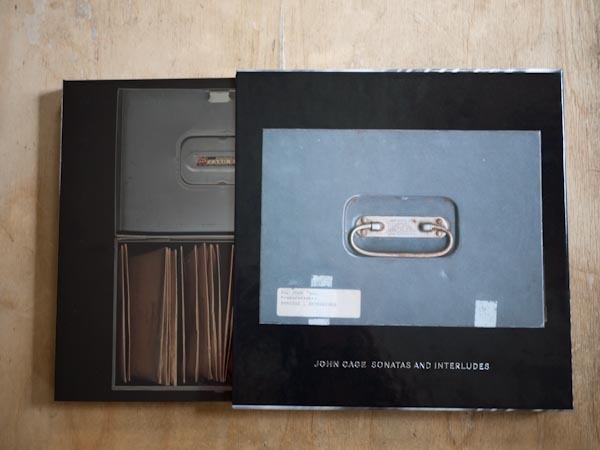 Thankfully, Anderson went one step further and weighed the preparations when examining these materials from the John Cage Trust. Most surprisingly to me is the variation of weight among the screws, many of which are heavier than the bolts. 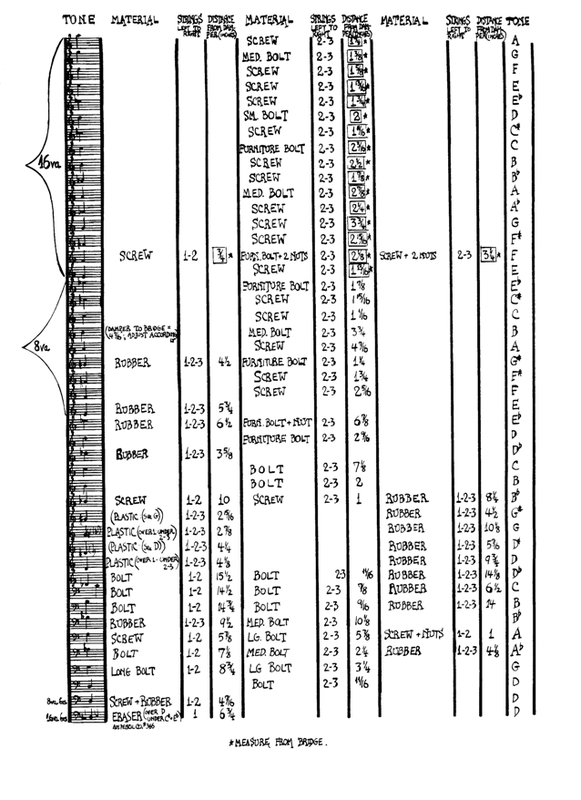 Though based on this chart it is unclear to which pitch each screw corresponds though he does meticulously measure each piece of material elsewhere in his thesis. Anderson’s work is really quite a fascinating read for anyone interested in an in-depth understanding of the prepared piano but much of it is out of the scope of this guide. His chart containing this information is below. The exact material is not necessary for the pianist to obtain. In fact, preparing different makes and models of pianos would make much of the content of these envelopes useless for the performer preparing the piano since much of it would not fit properly. This of course means that the sound palette of the Sonatas and Interludes will always vary among performances. It took some time for Cage to realize and accept that the preparations and resulting sounds became out of his control. This inability to control is one of several aspects that pushed him into indeterminacy. Cage addresses this in an interview with William Duckworth. Afterward, in this Duckworth interview, Cage was asked if he liked the way the Sonatas and Interludes changed every time they were performed. On that same item, in Cage’s 1949 document, he states that the preferred piano for the Sonatas and Interludes is a Steinway M. I think Cage confused the models of Steinways here. Perhaps he was poorly informed of the exact model he used or simply mixed up the models. In the table from the score, Cage measures the damper to bridge on the 2nd ‘b’ above middle ‘c’ as 4 7/16″ and to “adjust accordingly”. 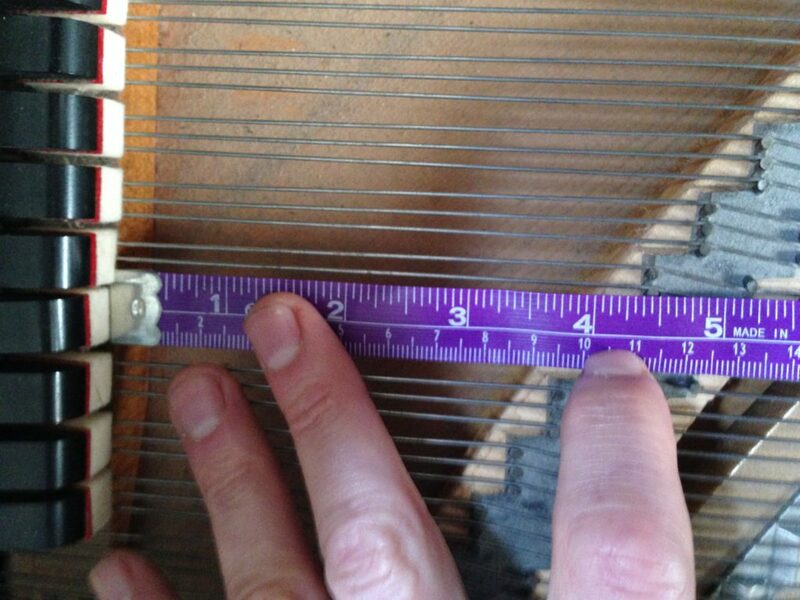 That measurement is the exact distance on a Steinway O, not an M. Despite the claim of the 1949 document, the preferred piano would seem to actually be a Steinway O. 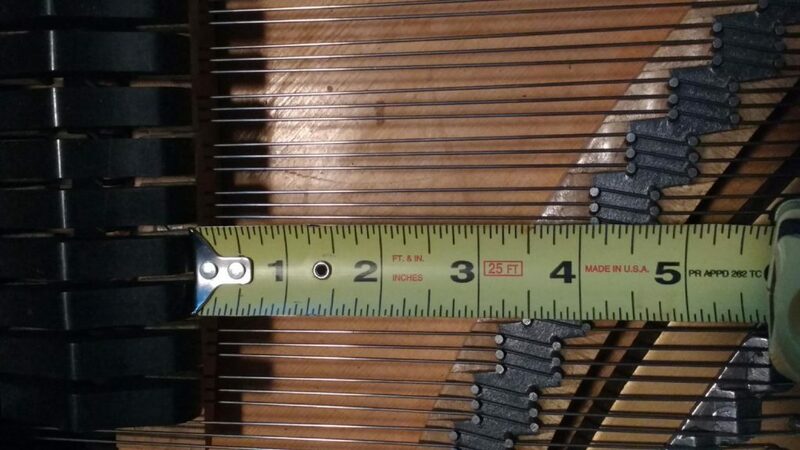 Below are photos of this measurement on a Steinway M (4 1/8″) and O (4 7/16″), respectively. If the performer is ultimately looking for a higher level of authenticity, I believe it is in the best interest of the performer to prepare a Steinway O and experience the sound of that particular instrument and get to know it well. While you can take his measurements and “adjust accordingly,” for other pianos, a better approach for me was to train my ear to the Steinway O and adjust the different piano based on my recollection of that sound. I am fortunate enough to own a Steinway O and have a good friend that owns a piano consignment store who was kind enough to let me prepare several pianos of various makes and models. I also believe this method of experimentation is in the nature of the music and will produce more interesting results than trying to emulate the sound of a past recording. Many recordings, some of the most ubiquitous ones, actually fall short of Cage’s intentions in these preparations. But more on that later. 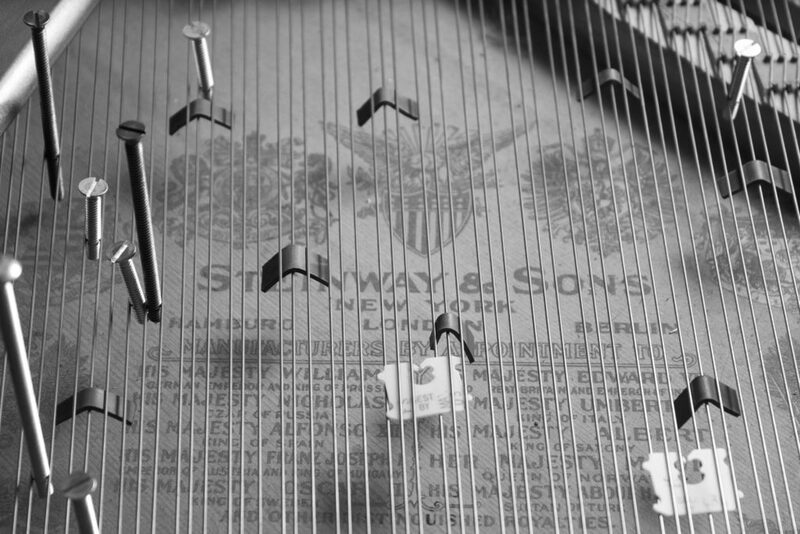 Aside from training the ear to the sounds of the prepared Steinway O, it is also beneficial to be acquainted with its design that can effect the preparations. I prepared a Knabe concert-grand for a recital in Seattle that provided a few challenges and knowing the Steinway O design helped to overcome them. The second-lowest ‘d’ in the bass that is prepared with a screw wrapped in rubber was insufficient for the Knabe. This particular piano had three strings for that note. Cage only asks for a preparation between strings 1 and 2 as there are not even three strings to prepare for that note on a Steinway O. Without knowing this, that third string would continue to ring and dramatically change the intended thud-like sound created by that note. 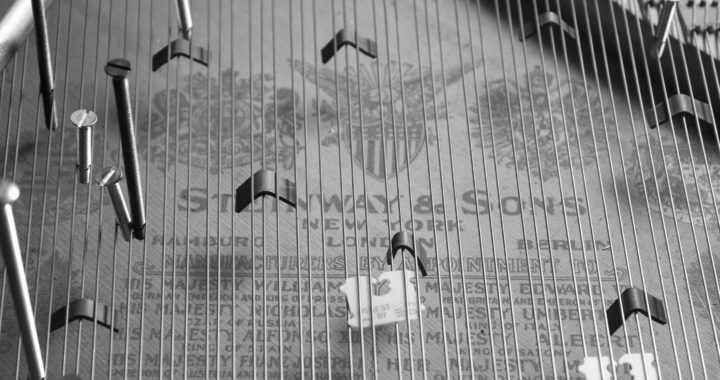 I added an extra piece of rubber between strings 2 and 3 at the spot of the screw to eliminate the ringing of this 3rd string and effectively make the note sound as it did on the Steinway O. Another problem this piano had was three extra dampers than the Steinway O. Since I had two hours to prepare the piano for the live performance and the bolts securing the action to the piano were stripped, I had no way to pull the action and take out the dampers. The preparations could not be positioned correctly because these three dampers were in the way. So I did the best I could with the time I had. But still, I would not be able to fully understand these problems that had arisen—or even that there was a problem—if I didn’t have experience preparing the Steinway O. 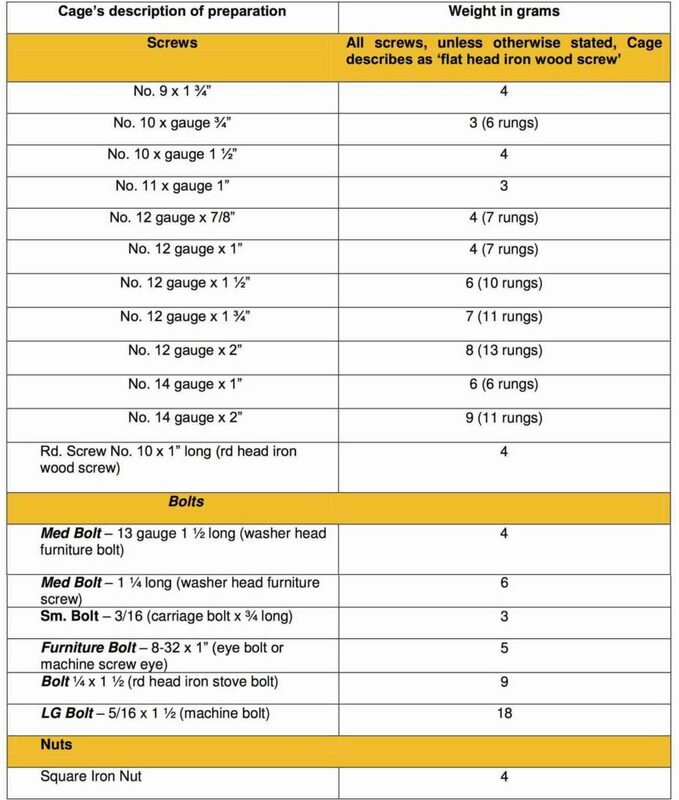 In the third item on the document, Cage better explains how to measure for these preparations and how to adjust based on other piano sizes. He also notes that some of the preparations should not be adjusted like the eraser and the very high notes. The fourth item also addresses the measuring procedure. The fifth item in the document is a very important one—it is the very first thing I do when preparing a piano. The fifth item in the document is a very important one—it is the very first thing I do when preparing a piano. Cage writes, “The action of the soft pedal is to cause the hammers to strike only the 2nd and 3rd strings rather than all three.” I have yet to sit at a piano to which I am ready to prepare and have the una corda pedal already working correctly. So much of the music of the Sonatas and Interludes depends on the una corda pedal work correctly in order to create this sonic shift. In the Sonatas and Interludes, the una corda pedal no longer functions to soften the dynamics of the piano, but to reveal an entirely prepared, gentle, and percussive timbre that is lurking behind the unprepared pitches of the instrument. Without this effect, the palette of sounds is greatly reduced. In order to quickly and easily adjust the una corda pedal, I usually stack extra pieces of rubber between the rod of the pedal and the mechanism under the piano, which essentially lengthens its reach and causes the keyboard to shift further when applying the una corda. Cage suggests having a technician fix this in advance or pull the action yourself to adjust the pedal. Ideally, the performer should run all this by the venue’s technician in advance of the performance. But if this isn’t possible for whatever reason, extending the reach of the pedal with rubber can work as a fast fix. But this moves the entire action and sometimes just a few hammers need adjusted. I was fortunate enough in a recent performance to sit side-by-side with a technician before the concert and he adjusted each hammer for a precise effect. To my surprise, this part of the process only took about 20 minutes. I’d like to share a recording from a recital of mine showing an example of this una corda effect. Sonata VIII uses the una corda throughout the entire piece, which eliminates most unprepared notes. This slow, spacious, and surreal sound-world created in this piece makes the sonata one of my favorites. Incorrect una corda adjustment is the most widely erroneous aspect of many recordings. Sonata VII is also a really great example of this beautifully unique sound palette created by the proper use of the una corda. The upper chromatic notes in Sonata VII should not sound chromatic as proper una corda pedal adjustment eliminates the unprepared pitches of these notes resulting in a fully prepared timbre. Now, I have great respect for Boris Berman—his Naxos recording of the Sonatas and Interludes was my introduction to this music. I found this music captivating from the moment I first heard it because of the phrasing of his melodies and the fidelity of the recording. Unfortunately, I can’t hear it the same way anymore because of the faulty (or lack of) adjustment of the una corda pedal. Compare Berman’s recording below of Sonata VII to that of the lesser-known recording by David Macbride. The difference is striking. You only have to listen to the first 30 seconds of each clip to hear and understand the difference. Two distinct timbres are heard from Berman’s right hand chromatic passage. Only the gong/percussive sounds from the right hand of Macbride’s recording are present. Cage only intended the prepared sounds in this passage—the unprepared piano sounds from the right hand should not be heard. The chromatic sounds of the rising and falling notes are correctly absent in Macbride’s which results in a beautifully percussive, zig-zagging array of harmonics and timbral changes. So why did Boris Berman’s ubiquitous recording miss this important detail? Probably because this document is not easily forthcoming and certainly much less so at the time of the recording. I should also note that he is not alone in this mistake. If a pianist is only equipped with the score and is preparing pianos entirely based on the table within the score, it is no wonder why a pianist could miss this detail. I know in the case of live performances that preparing the piano can only be done as well as the time permitted to prepare it. Sometimes sacrifices have to be made which may mean a less-than-ideal preparation. But in the case of studio recordings, it is apparent to me that pianists are simply overlooking the important effect of the una corda. And despite the fact that all of Cage’s preparations still have—and always will— degrees of ambiguity and choice for the performer, the palette altering effect of the una corda is not one of them. The sixth item in this document discusses adjusting preparations based on memories of past proper preparations and the recording of Maro Ajemian. Ajemian, to which Sonatas and Interludes is dedicated, is often sited by Cage for performers to refer to her early recording. Here is her live 1950 version of the properly prepared Sonata VII. If the performer should follow Cage’s instructions here and intend to emulate a past recording, then they should certainly check out more of the work produced by the John Cage Trust. Big Fish Audio has sampled the sounds of a prepared piano using some of Cage’s original preparations that are held by the Trust. Also, Jack Freudenheim designed the handy (or hand-held) iPhone and iPad app using Cage’s original preparations as well. Both can be very useful in reaching a higher level of authenticity. Finally, given all of this information which is ripe with more questions and persistent ambiguities, the performer must still question their desire for authenticity. Is the performer expected to create an authentic performance as Cage intended or as he heard it? I believe that is a very unrealistic and unfulfillable expectation both on the part of the audience and the performer. But these historical documents are still an invaluable resource to the performer as it will help them arrive at a better-prepared piano. Though following his measurements for the placement of preparations and the relationships of weight among them may not work for a particular piano and it may not provide the performer with an interesting and desirable sound, these should always be used as the way to begin the process of preparation. Did I miss something? Do you have something to contribute to this guide? Please let me know in the comments section! Wow, impressively thorough! And no doubt useful to those who attempt this work. The John Cage Trust website references The Well Prepared Piano by someone named Richard Bunger (the name leaped out at me, given that it’s my pre-married name and very uncommon!) Just wondering if you came across this publication in your research? Bunger has some interesting stuff on his website, including a description of his meeting and performing for Cage. Interesting, Ann. I did come across the work, summarized or referenced by others. The focus is apparently on not damaging the instrument and the process of generally preparaing the piano. The music of Cage or the piano preparation of Cage’s music is not a focus in that manual. It looks like it can be purchased for $75 on his site. That’s the only available source I could find. Given the focus of my article on Sonatas and Interludes preparation for the music—not making the process benign—I passed on the purchase of the manual. I did also find interesting his invention called the “Bungerack”, a contraption to allow pianists to view sheet music while still being able to reach inside the piano while playing contemporary compositions. Wonder how successful that was! BTW, loved: “a frame of mind conducive to overcoming obstacles with patience.” Classic Cage wisdom, applicable to so many things…. Never seen anyone use that, but laying the score on the tuning pins is an okay solution if you can handle the angle. And yes, that Cage wisdom is part of the allure for me. I love the process. I’d like to draw your attention to my dissertation “Extended Piano Techniques in Theory, History and Performance Practice”, in which I deal wioth Cage’s preprations at length, treating amongst other aspects (theoretcial, p.76-80; historical, p. 694-741; performance practice, p.963-964, p972-976) the original preparations for the Sonatas and Interludes with photographs and measurements on pp.996-1030. You can download the dissertation for free on https://openaccess.leidenuniv.nl/handle/1887/15093. Thank you very much, Luk. I did, in fact, come across your name during my research with this blog post—but not your dissertation. So thank you! I’ll check it out. And thank you for providing this link so others can dig deeper! I can’t recall at the moment where I came across your name… Maybe it was while talking with Laura Kuhn about going through the preparations. You must have visited the JC Trust to access these? One of the questions I had for Dr. Kuhn was whether or not the preparations between different kits were of identical measurements. Without detailed measurements immediately on hand, she said there were probably variations among the kits at the Trust. Cheers! I made the measurements and photographs at the Cage Trust premisses a few years later. At that time, it was the only known kit. Later, Laura found another one, as I understand it. So the comparison is still a project worth planning! Nevertheless, between preparations with the same name in a single box, some differences are already noticeable. Many thanks for this entry, Jesse. I’m teaching a class this semester for pianists at Juilliard which includes two sessions on the Cage Sonatas and Interludes. It’s great to read about your experiences and also see video from Stephen Drury and Margaret Leng Tan. I’ve played the Three Dances for Two Prepared Pianos, but not the S + I. Much appreciated. Sure thing, Jacob. If you need a pianist to come out for a demo on these wonderful pieces, let me know. Always happy to perform these for students with a hands-on workshop.